Knights of Creativity Spirit & Ale: Jimi Hendrix Turns 65! Never too old to Rock N Roll and too young to die, Jimi Hendrix turns 65 today! 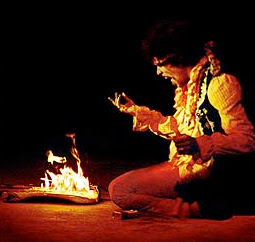 As one of my top 5 guitar heroes and influences on my own guitar jams, Jimi was a power house that literally went up in flames at the height of his career. Being an idol, a genius, an icon for a generation is not an easy burden to bare. At least Jimi is Rockin the choirs of Heaven today on his birthday. "Excuse me while I kiss the sky!" Carpe diem to Jimi all day.